In my quest to find good places where to post links to my survey, I happend on gamesforum.com, which I recommend for discussions, but not for posting research questions! I posted without reading through the entire board, and the administrators received my post in a friendly manner - but noted that I'd probably not get a lot of replies, as they had been flooded with surveys lately. That's when I started reading. If you're interested in seeing what kind of research questions the coming generations of researchers are asking, check gamesforum.com! There they are, the links, and the questions and the presentations. Finland and California, the games researchers unite in the search for good respondents. It's quite amusing as well as, of course, an extra challenge to getting my respondents. And it gives me an idea about what kind of questions students ask. While we all hate to be tracked, supervised or in other manners controlled (well, ok, not all, some need to know they are supervised to be happy), to be able to track other things is oddly satisfying. I am watching the progress of a package that's making its slow way towards me, from it's sent, through the many terminals where it's re-loaded. With some luck I should have it tomorrow, as today's stop should be the last one before here. It might seem slow - this is the third day I am tracking this - but I was told it might take two weeks before this arrived. So, I am delighted, and if it's as nice as I think, there might soon be a new exstatic tech blog post! If you would like to send me a picture of your digital gaming set-up, whether it's a laptop or a monster machine with specially built chair, please send it to research dot game at gmail dot com. Isn't it impressive? All black and blue with some touches of green and purple (like a bruise you'll be certain to remember for a while) Perceiving Play, the art and study of computer games. And I sincerely hope the impact if this book isn't too painful. It's a slim little thing, after all. From the world of amazing research: Belly-button fluff. The research of the Austrian researcher Steinhauser has revealed what belly button fluff is made of, and how come it migrates to the belly button. It turns out that it is avoidable, you just have to shave your belly, alternatively get a belly-button piercing. Knowing that the main carrier of belly button fluff is an overweight, middle-aged male, the image of shaved bellies and pierced belly buttons is perhaps slightly disturbing. Georg Steinhauser does not only stare at bellies though. From the Technical University of Wienna, 2008, a report of his research on the chemical fingerprint of volcanic eruptions through studies of pumice. I just bought a used book, Tracy Fullerton's Game Design Workshop, after strong endorsement of it during a recent meeting. I am not working with games at the moment, lecturing on persuasion and democracy in the media mostly, but I wanted to write my name and shelf the book. That's when I saw it. This book had a greeting written on the first page. In 2005, this book was a present from a loving father to his son. What can I say - there's hope, when parents choose to challenge their children by offering them reading they can actually learn from, books that can give them structure and understanding of how things work. I do feel a little sad that the book is here. But it looks like it's been at least carried around a bit, although the back of it is unbroken - if he did read it, he did so gently. Today, in between preparing lectures and despairing at my own lack of discipline, I keep googling "bento box japan" or "bento lunch recipe". I have ordered a Bento box from Ebay, and am waiting, exited, for it to arrive. Bento is a way ot organise a meal so that it can easily be transported. Many societies put a lot of effort into bringing meals with them from home. The Japanese bento boxes are the modern, often very high-tech (it's japanese), but always beautiful answer to the problem of bringing food. In India they have people who live from fetching lunch boxes in people's homes, dropping them off at work, then picking them up and taking them home. In Norway, we have two slices of dark bread, one with white and one with brown cheese, wrapped in waxed paper and eaten with coffee, milk or water, the infamous Norwegian matpakke. With my food-issues, I haven't had a regular matpakke for almost 8 years. I have been lunching on salads or left-overs from last night's dinner, contained in tupperware type containers and sometimes, when possible, heated quickly in the microwave. This is ok, and works well, but imagine my delight when I started looking up different types of lunch boxes, and found the bento-boxes. Not to mention the community around them and the recipes and ideas this community generates: I love it. While I am not all that picky about food looking pretty, and I don't think I'll be arranging pink bunnies or create desserts that look like cherry blossoms, I am looking forwards to a simple and easy way to separate foods which should not be mixed, this way giving myself more options while keeping the packaging compact and in one unit. Also, the boxes are pretty! Not yet in a mailbox near me, but I can see it on Amazon. What? 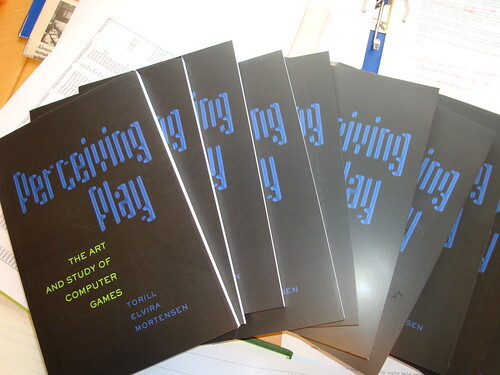 Oh, just the book of books: Perceiving Play - the art and study of computer games. It's with very mixed feelings that I see it for sale. I have put a lot of work into it, and so have the editors and everybody else who have been in touch with the process. Now it's out there, and it is pretty scary, because that means others can pick it up, read it and tell the world everything that's wrong with it. And I know it's not perfect. It's just the best I could do at the time, within the limitations I had given it. I think it should work pretty well to make people see that research on games is a lot more than researching violence and addiction (which does not happen in the proportions one might think from the media.) It should also be a fair enough place to start when you want to find other research on games. And perhaps it has an interesting thought or two. I hope. But I am still pretty proud of it! A better place to learn about the book may be a Peter Lang's website, where you will also find links to many of the other interesting books in the same series.